Strange Laci, The page that you got this from seems to be gone already. Most of the comments of course seem to be more the hope you fry in Hell direction. Interestingly, most of the pages that are there seem to somehow link him to the anti-police brutality cause. Interesting that you seem to work so hard at linking this particular killer with a very large and varied following with its share of extremists, just as there are with those that follow Islam. Interesting you want to reject the fact that gun loons were cheering for this killer. Are you referring to this screencap that Laci provided? Not rejecting it. Just saying it doesn't show any more widespread support than for example, the support of the Westboro Baptist Church. When you say any more ....I guess you are saying what the Westboro Baptist Church does is acceptable. Like it's no big deal. I don't care how small their numbers are if you don't speak out against their BS you are not practicing the responsibility of free speech. Nonsense Anon. But trying to brand all Christians with one Facebook post makes no more sense than trying to brand all Baptists based on Westboro. There are a lot more gun loons that support this killer than Baptist support Westboro. The problem is: 99% of cops give the rest of them a bad name. 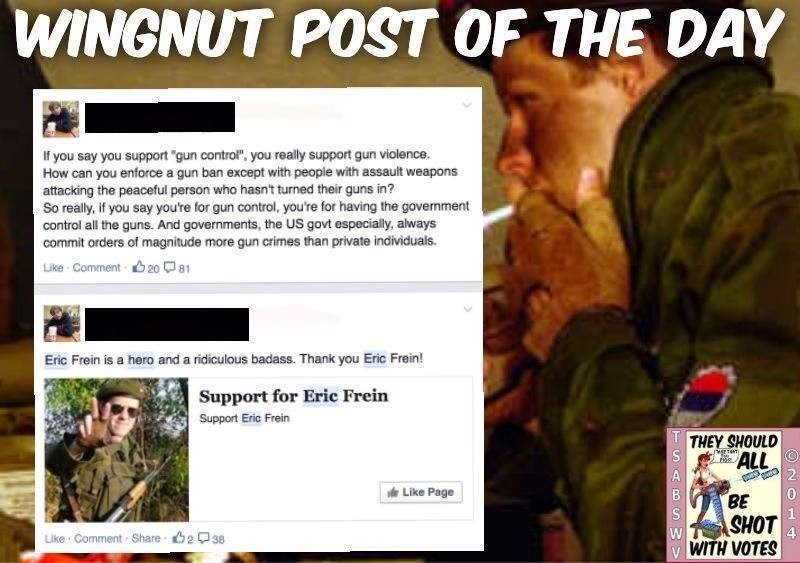 I would guess that among the true gun-rights fanatics, there is a certain percentage that does support what Frein did, especially the three-week evasion.
. . . especially the three-week evasion. Another entry for the Mikeb-to-English dictionary: "three weeks" means "seven weeks." I am just surprised he managed to evade for three weeks and doing so by staying in the same general area. I don't support Frein at all, I am however disappointed in the police dept. He had to be getting food and water from somewhere and that means his face had to be out in the open at some time. What were they waiting for, another attack? "Another entry for the Mikeb-to-English dictionary: "three weeks" means "seven weeks."" Another eagle-eyed catch by Kurt, who like the insecure weakling he is, cannot resist pointing out every mistake made by others, like his constant use of [sic]. It's a way of pretending he's truly superior. The discussion was about Frein and whether or not gun fanatics applaud his actions - that was before Kurt took us on another diversion. It's a way of pretending he's truly superior. No pretending, and I'm only claiming superiority over you and your ideological allies--which could actually be characterized as "damning myself with faint praise." criminals like you are not superior to non criminals.